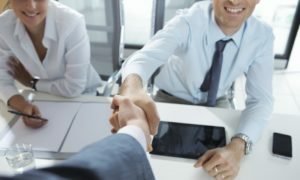 TOP 7 Personal Banker Interview Questions for 2019 - Ready to Answer? Personal banker belongs to popular customer service jobs. If you apply for this position at one of the big banking institutions, you will always face a competition of many job seekers in your interview (sometimes more than twenty people). Unless you manage to demonstrate excellent communication and sales skills, and a decent knowledge of banking products and services they offer to their clients, your chances of succeeding in this interview, and signing a new job contract, will be very slim. 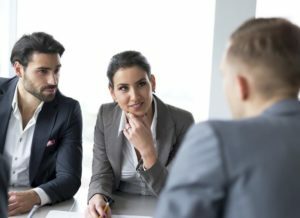 We prepared a list of common interview questions for this job, to help you to prepare for the meeting with the HR managers (or with a branch manager, who can also lead the interview in a banking center). Why do you want to become a personal banker? Why do you want work at our banking institution? Here is a product we offer (e.g. a loan). Why should the clients decide to take this particular loan? What characterize a good personal banker? How would you deal with a simple customer? Do you apply becasue you need (and want) money, or is there something else that drives you forward? We all need to earn money, but the difference between an average and an excellent employee (a difference each customer of a bank will easily spot), is that an excellent employee does not go to work only to earn money. They go to work to do a good job, they do it because they enjoy doing it, because they see a purpose in what they do. Money is just a nice reward for them, a compensation they have to receive each month. It is not their main driving force, however. Speak about the value you want to bring to the bank, your good knowledge of banking products, or skills that are relevant for the job. Tell the interviewer that you enjoy helping people, that you enjoy doing the things personal bankers do on a daily basis. Show them that you do not think only about money. Most job seekers do not care whether they get a job with Bank of America, or with Deutsche Bank (or with any other banking institution). People want the job, and any bank that hires them is good enough. But you should do your best to convince the interviewers that their bank is special in your eyes, that you did not apply by a chance, and that you prefer them to other, competing institutions. Visit the website of the bank, and check all sections that have something to do with their products, and with their corporate identity. Then visit their social media profiles, and do the same thing. Write down things which you can praise them for, such as interesting products from their portfolio, vision and goals the bank follows, creative marketing campaigns they run at the moment, great working environment, excellent reputation of the institution, good reviews from former employees, or from the customers, etc. Speak about these things when you explain the reasons why you want to work for them, and not for some other banking institution. * And if they are not special in any way, you can refer to a good location of a banking center (close to your home), or perhaps a recommendation you got from someone who already works for the bank. This questions is your chance to show the interviewers that you understand the features of banking products, that you can use the right terminology while describing them, and that you can present the benefits of the products to the clients in a proper way, a way that reflects their needs and desires. Try to focus on the benefits the clients will gain with their purchase. You can also ask the interviewers for additional information (to find out the details of the product, the target group of customers, etc). This information will help you to build an excellent answer. You have several options when answering this question. One of them is listing the characteristics and personal traits, such as great listening skills, loyalty, ability to build relationships with the clients, ability to pitch them in a right time, and do it in a right way, responsibility, attention to detail, etc. Another option is to summarize these things in a single sentence, saying that people enjoy talking to a good personal banker, that they trust them, and will do business with them repeatedly. The third option is to talk about results. After all, the results matter the most for every employer. You can say that a good personal banker is the one who reaches the sales targets each month (or any other targets the bank sets for their employees), the one who maintains an excellent level of customer satisfaction on an ongoing basis. Not every client is nice, not every person is clever. Meeting angry or simple people belongs to this job. Your goal is to convince the interviewers that you do not mind talking to angry people, or to the people who do not understand even the most simple instructions you give them. Tell them that you would use a simple language, and give the customer many questions, to ensure that they understood your message, and know what to do next. Perfect job does not exist. We all have to deal with tough situations in work. Show us that you count with experiencing difficulties, and that they won’t affect you negatively in your job. Interviewers ask this question primarily to find out if your career plan matches the possibilities they can offer to you. Most big banking institutions have an exact career growth plan for each entry level job outlined. You can find the plan on their corporate website (in the careers section). Your answer should correspond with this plan. Private Service Manager, or Store Manager, are the next career steps for most personal bankers. One can also specialize further and become a mortgage consultant, or sales consultant, depending on their priorities and experience they will gain while working as personal bankers. Hiring is getting expensive, and many banks struggle with high job hoping rates. Therefore you should try to convince the interviewers that you are a loyal employee, that you want to grow with them for many years. Remember that you do not have to keep the promise you make in an interview. Life is a change, and nobody knows what tomorrow will bring. Maybe you will really work as a store manager in five years time, in the same bank, and maybe you will have a completely different occupation (or live in another country). Once you interview for a job, however, you should do your best to succeed in this meeting. In this case it means to convince them that they can count on you in a long run. You can expect at least one role play in your interview (even if you interview for a job in a group of people). In a role play, the interviewer will play a client of a bank, and you will play the banker, or a teller. For some advanced help (great answers to twenty most common interview questions for personal bankers–multiple answers to each question, sample role plays with answers, etc), have a look at an eBook called Personal Banker Interview Guide, from Jack Groner, interview coach and former interviewer at Citi Bank. We highly recommend Jack’s eBook, as well as his other writings. Check samples and see for yourself. How to dress for your interview – Four rules to consider when choosing clothes to wear. Every detail matters once you compete for a job with ten or twenty other job seekers. Dress for success, impress your interviewers, and get the job. Body language in an interview – What do your gestures and movements say about you? Can we control our non-verbal communication? The short article reveals some mysteries that relate to our body language in an interview.